Today, Singapore is ranked among the world’s most competitive economies and among Asia's most livable cities. Photo credit: ADB. 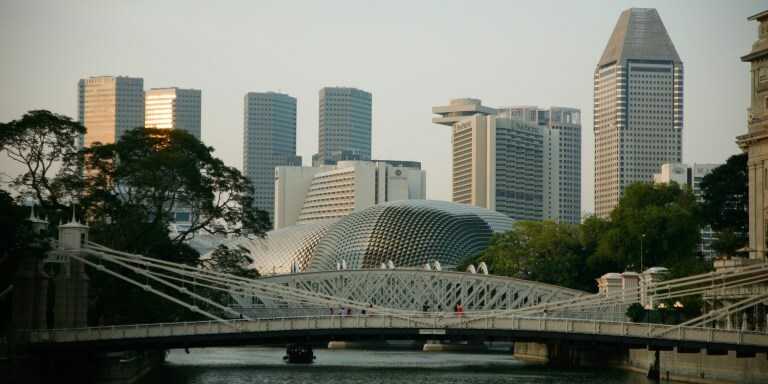 Singapore reinvented itself into a world-class city by taking an integrated approach to sustainable urban development. Singapore has risen to become a model city-state by committing to long-term development focused on achieving a competitive economy, a sustainable environment, and a high quality of life for all. The country’s experience in fostering urban sustainability offers many lessons for Asian cities grappling with the ill effects of urbanization. This case study was adapted from a presentation made at the Asian Development Bank's Asia Leadership Program. Fifty years ago, Singapore was not anything like the country it is now. It faced the same challenges many cities now face—unemployment, urban slums, poor infrastructure, sanitation issues, and an unskilled labor force. In a population of 1.6 million, 14% were unemployed in 1959, up from 5% in 1957. The birth rate rose by 4.4% annually between 1947 and 1957. In addition, one in four persons was poor, and about 250,000 people lived in slums. In just one generation, however, all these changed. Singapore transformed itself from urban decay into one of the most livable and wealthy countries in the world. Singapore embarked on an ambitious and complex plan, which is illustrated by the Singapore Liveability Framework (Figure 1). This strategy had three desired outcomes—a competitive economy, a sustainable environment, and a high quality of life. Singapore’s Integrated Master Planning and Development approach incorporated non-negotiable values, such as thinking long term, building in flexibility, executing policies and projects effectively, “fighting productively,” and innovating systemically. This enabled the government to balance its priorities in a country with limited physical resources and a land area today of just over 700 square kilometers. It met current needs while keeping an eye on the country’s long-term plans. Lead with vision and pragmatism. Build a culture of integrity. Involve the community as stakeholders. In support of its long-term goals, the government strengthened anti-corruption measures and built a culture of professionalism and competence in the public sector. It also involved the private sector and communities in the planning and development of Singapore as a livable city. This approach demonstrated the government’s political will and vision, its sense of accountability, commitment to transparency and good governance, and its ability and willingness to create structures and policies that facilitated development. With guidance from United Nations experts on urban renewal and development, Singapore crafted the 1971 Concept Plan, its first blueprint for long-term development. It is a strategic land use and transportation plan that guides development for 40 to 50 years. It is updated every 10 years to ensure that there is enough land for growth, and it provides for a good living environment. The Concept Plan is translated into detailed permissible land use and density plans in the Master Plan, which guides development over the next 10 to 15 years. It is reviewed every 5 years. The 1971 Concept Plan envisaged a Ring Plan: a city with self-contained but connected settlements around the island. Each settlement would have green and open spaces, such as parks. It shaped the city’s landscape, and outlined the key transport developments seen in the city today. In 1991, Singapore adopted the “constellation” concept. It moved commercial activities away from the city center to transport hubs, and initiated the development of high-density residential areas near train stations and bus interchanges. It provided technology corridors—transport ways within or near city and regional centers lined with business and science parks, colleges, and universities. Updates to the plan in 2001 balanced and integrated the needs of the growing financial and service sectors with the need for cultural identity and heritage. The most recent review in 2011 emphasized strategies to sustain a high quality of life amid changes in population. Singapore has long adopted a green policy. Two years after it gained its independence in 1965, it launched the Garden City program, which provided parks throughout the city and created nature reserves. The government kept air and water pollution at bay through several programs. Initiated in 1968, the Keep Singapore Clean program reduced air pollution through the 1971 Clean Air Act, and cleaned up the highly polluted Singapore River and Kallang Basin. Active, Beautiful, and Clean Waters (ABC Waters) was launched in 2006 to transform concrete drainage canals into naturalized waterways. To further green the city, the government reduced road congestion, promoted public transport use, and is making streets more conducive for walking and cycling. Bishan-Ang Mo Kio Park is one example of this green policy. Under the ABC Waters program, the concrete canal in the park was converted into a meandering, naturalized river with a floodplain. River banks were bio-engineered to combat erosion, and various plants and beddings were used to improve water quality. During dry periods, the river flows through a narrow channel, but during the rainy season, the floodplain functions as an expanded channel to carry storm water. The river flows through the park and passes by housing areas. It has attracted many species of wildlife, such as birds, butterflies, and even otters. The government launched its first economic development plan in 1961, which focused on industrialization and attracting foreign direct investment to create jobs. In the 1990s, the government initiated the cluster development strategy. Backed by a S$1 billion Cluster Development Fund in 1994, it catalyzed the development of high-growth clusters of related and mutually supporting industries (e.g., electronics, petrochemicals, and other high-tech industries). These clusters became an enterprise ecosystem of large companies and innovative startups that would generate, harness, share, and exploit new knowledge and capabilities. In the 2000s, Singapore strengthened its position as the operational headquarters of global companies. It enhanced its capacity as a financial, logistics, and transport hub. It also invested in soft infrastructure, such as education, to complement its hard infrastructure to keep systems sound, as industrial activities became more complex and land use more constrained. The country also capitalized on its extant knowledge-based economy by investing in research and development capabilities, while nurturing local talent and attracting global talent. It established networks of public and private research centers that collaborate with companies to commercialize technologies, processes, and products. Today, Singapore is ranked among the world’s most competitive economies. And it is among the few high-density cities in the world with high livability standards. After its independence, gross domestic product of Singapore grew at an average of 7.7% per year. GDP per capita improved by more than forty times since 1960. The country achieved full employment in the 1970s. Singapore continues to lead in global markets today. It is the world’s busiest transshipment hub, develops six out of the world’s top ten drugs, and manufactures 40% of the world’s hard disk drives. In the World Economic Forum’s Global Competitiveness Report in 2015, 2016, and 2017, Singapore consistently ranked second. From 36% in 1986, the city’s green cover grew to about 47% in 2007 and to almost 50% in 2010. It has 72 hectares of rooftop gardens and green walls. Singapore continually monitors air and water quality, and ensures energy efficiency. It has shifted from fuel and oil to natural gas as its main energy source. It has substantially reduced its emissions over the last decade. In 2016, the Arcadis Global Sustainability Index ranked Singapore as the second most sustainable city in the world and the most sustainable in Asia. For Singapore, a high quality of life is a healthy mix of the physical environment and intangibles. It includes adequate transport, housing, green spaces, recreation, culture, and heritage, among other things. Keeping pace with the increasing population, the size of Singapore’s rail network will double to about 360 kilometers in 2030 from 183 km in 2014. Home ownership continues to go up, reaching 90.89% in 2015 from 88.6% in 2011. In addition, total area of land allotted to parks has also increased to 2,920 in 2014 from 2,770 hectares in 2010. In 2016 and 2017, Singapore topped the Mercer Quality of Living City Rankings in Asia. It was also adjudged most livable city in Asia by The Economist’s Global Liveability Index 2017. Singapore’s transformation yields many lessons for urban development. One of these is the importance of balancing different priorities through integrated and evolving concept and master plans that envisioned the country’s development in the long term and in the short term. The government adopted strategies that promoted the optimal use of land and other resources. It pursued economic policies that strengthened the country’s competitiveness. Singapore’s growth over the years is a product of good governance. A clear vision and a strong political will drove its development. The country’s leaders made difficult decisions that at times went against popular opinion, such as enforcing strict land use policies. Collaboration and consultation are also keys to Singapore’s success. The government created avenues for dialogue, such as online platforms where people can give feedback and ideas on development plans and projects. Communities supported the campaigns to make the city clean and green. The government also partnered with the private sector in improving public service delivery. Asian Development Bank. June 2017. Proceedings of the Asia Leadership Program 2017. Asian Development Bank Institute, Tokyo Japan. Centre for Liveable Cities & Civil Service College. 2014. Liveable and Sustainable Cities: A Framework. Singapore: Centre for Liveable Cities & Civil Service College. IGI Global. 2012. High Technology Cluster Growth Initiatives in Singapore. Retrieved on September 30, 2017. Khoo Teng Chye. July 2012. The CLC Framework for Liveable and Sustainable Cities. In Urban Solutions Issue 1. N.C. Saxena. 2011. Virtuous Cycles: The Singapore Public Service and National Development. Singapore: UNDP. Singapore EDB. 2016. Our History. Retrieved on September 20, 2017. Urban Redevelopment Authority. 2017. Master Plan. Michael Koh is a Fellow with the Centre For Liveable Cities, a division of Singapore's Ministry of National Development. He has 25 years of public service experience, including 6.5 years as CEO of the National Heritage Board and 3.5 years as concurrent CEO of the National Art Gallery. Prior to that, he was the Director of Urban Planning & Design and Director of Physical Planning at the Urban Redevelopment Authority.